Cardoons are one of my favorite winter vegetables but they can be hard to find. So when I spied some in the market the other day I did a double-take and smiled. I hadn’t had them quite literally for years. The bunch I found was a bit bruised but would still be quite usable after they were trimmed. Cardoons look like overgrown celery but taste very much like artichokes, which is not surprising since they are of the same botanical species as globe artichokes. For this or any other recipe, you want to prep your cardoons. They need to be properly trimmed of their leaves, which grow from the top and edges of the stalks, then cut into lengths, scraped on their outer sides to remove the fibrous ribs and hard green skin. (It helps to split them in half lengthwise so they lay flat on your cutting surface.) Like artichokes, they should be immediately submerged in acidulated water to prevent them from discoloring. They then should be simmered in salted water for about an hour (or 15 minutes under pressure) until they are quite tender. You are then ready to use them in a variety of ways. Bake in a very hot oven (220C, 250F) until nicely golden brown on top. Allow to cool off a bit before serving. Cardi gratinati would normally be a side dish. Cardoons have a wonderfully subtle flavor that goes with just about any roasted or braised meat, or even fish. But made this way they are so satisfying you could easily make a light dinner out of them, served with crusty bread and followed by some fruit and cheese. For an even richer version of cardi gratinati, top each layer with a fairly loose and well-seasoned béchamel and grated parmesan cheese, dotting with butter on top. Nutmeg adds a nice extra bit of flavor as well. In Puglia, a very different version of cardi gratinati calls for baking the cardoons with minced garlic, capers, pitted olives, grated pecorino cheese, sprinkled with bread crumbs and drizzled with olive oil. 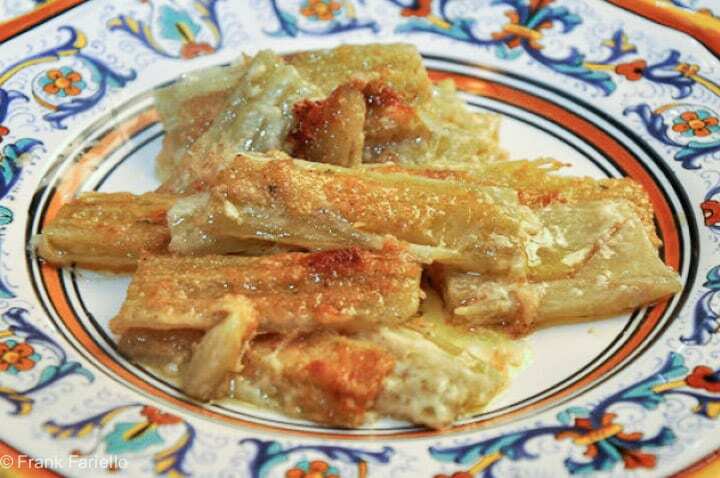 Cardoons are also very good prepared in a myriad of other ways: in soup, simmered in tomato sauce, with anchovy and butter sauce, simmered in cream. It really is an incredibly versatile vegetable. (If you read Italian, see this useful webpage for a good survey of recipes.) Personally, I particularly like them breaded and fried. And cardoons are one of the classic vegetables to serve as part of a bagna caôda, one of the signature winter dishes of Piemontese cuisine. For more background on cardoons, see this article. 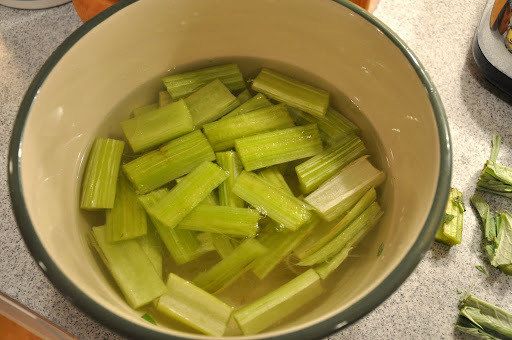 And for a more detailed explanation on how to prep cardoons for cooking, see this post. We live in Riverside, CA. And I just got home from Stater Brothers market, where I had picked up some Cardi. I have never had it, and bought it manly to possibly plant the end. As it has enough sticking out. I hope the below info helps those looking for it. The growers/ suppliers of the Cardi are in CA. Hola, no conocia tu blog y me ha gustado mucho, esta receta de cardos parece deliciosa!! now I know this is ever so flavorful as you describe it and would be a delight to enjoy – I don't think I have seen cardoons around here but now I am on the look…. No cardoons down under. Maybe I have to look harder. I keep seeing them here in Liguria, but so far had shied away from them, because I wasn't sure what to do with them. Thanks for the tip. Oh and great interview! I agree with you about cooking not being an exact science and the exact quantities can be misleading. Keep up the good work! I did introduce cardoons not so long agao as a forgotten veegetable! Sounds delicious. I never had this and wonder if I can find it in southern California.